As per the recent NEIGRIHMS notification 2018, the eligibility details like Educational Qualification & Age Limit for the CSSD Officer, Chief Fire Guard job has given below. Retired CSSD Officer of any reputed Institute/ Hospital Or 1. M.Sc Microbiology or Pharmacology or Medical Technology (Microbiology) 2. Five Years experience in Central Sterilization or Operation Theatre in a Hospital above 300 beds/ Research Organization or any Pharmaceutical organization. NEIGRIHMS may follow the following process to select the candidates. How to apply Recruitment for NEIGRIHMS CSSD Officer, Chief Fire Guard Job? Step 7: Complete applications may be sent in the prescribed proforma to the “Recruitment Cell, Establishment Section - III”, North Eastern Indira Gandhi Regional Institute of Health and Medical Sciences, Mawdiangdiang, Shillong - 793018 SUPERSCRIBING “Application for the post of …………………………………...…………….....”. 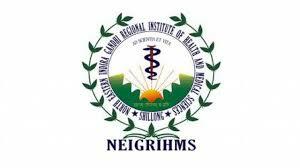 Prescribed proforma of application form can be downloaded in PDF format from Institute’s website http:/www.neigrihms.gov.in.